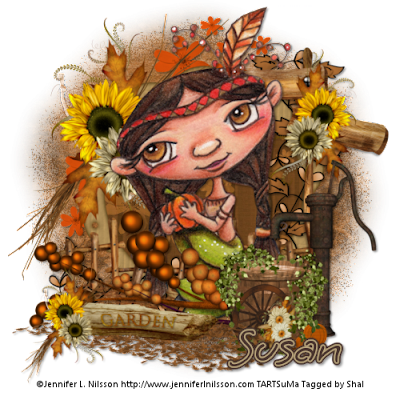 Dee, from our CT, wrote this gorgeous tutorial using Susan's newest kit "A Touch of Autumn". Thank you so much Dee. 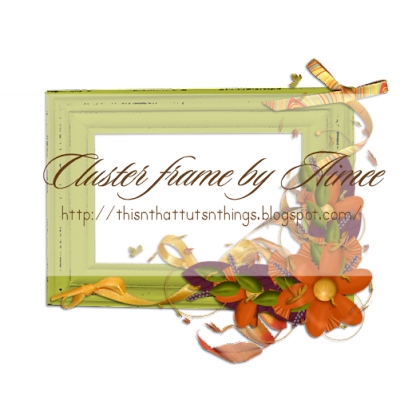 She has also created this delightful Cluster Frame which is available for download from her blog. 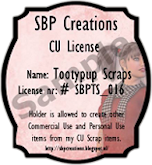 I came across this tutorial in one of my copyright compliant groups using Susan's "Bippity Boppity Boo" Friday Freebie from a couple of weeks ago, and written by Myrtle. Month End Madness Sale @ TKO! Yep...it's that time of the month again! TKO's Month End Madness Sale! 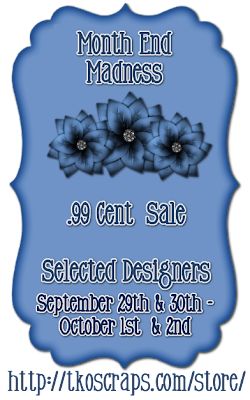 So step right up and bag a bargain with my products just .99 cents!! Yep, that's right .99 cents!! But be quick....sale ends on Saturday 2nd October!! 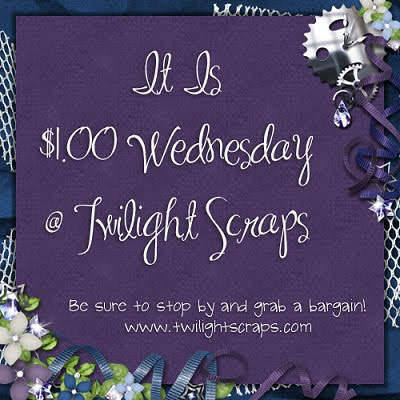 $1 Wednesday NOW @ Twilight Scraps! All my products just ONE DOLLAR for one day ONLY! 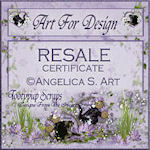 Click AD to go to my store NOW!! 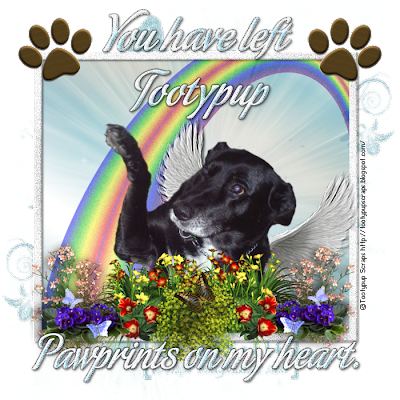 Despite her awful week this week at having to say goodbye to her best friend, Tootypup, Susan has completed a new kit for you all. touches my heart. A peaceful Serenity fills your heart. To watch children play in the mist of a early dawn on a new Autumns day. The golden tones touching the dew of the gardens shadows. Yes I love this time of the year before the Winters snow. Hope you enjoy this kit. 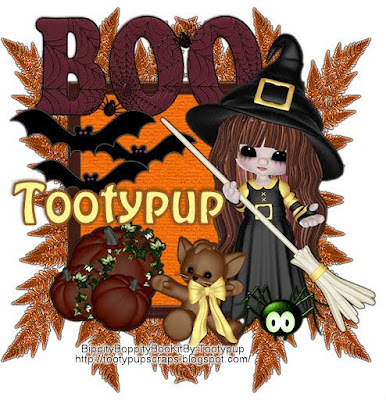 Happy Autumn to you all from the PUP ...... Happy Scrappin"
Cari of Black Widow Creationz has written this delightful tutorial using Susan's "Forever Fall" kit. Thanks so much, Cari. 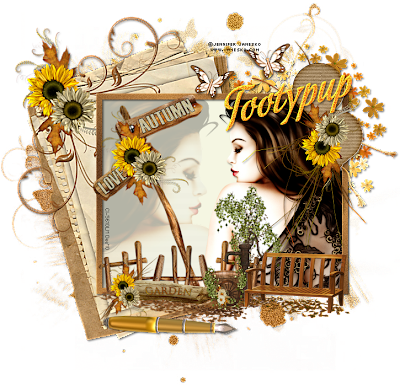 Sandee, our newest CT member, has written this gorgeous tutorial featuring Susan's "Forever Fall" kit. Thank you Sandee - Susan will adore it!! She loves Autumn - it's her favourite time of the year - with the added touch of fantasy. 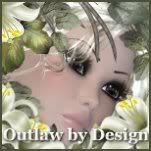 Julie, from out CT, wrote this darling tutorial featuring Tooty's "Fantasy Garden" kit. Thank you so much Julie. Susan will love it. Despite the awful week Susan (Tooty) has had we still bring you the Friday Freebie. This week is a former collab called "An Autumn Romance" which is appropriate for this time of year in the northern hemisphere (though here in Austalia it is Spring). 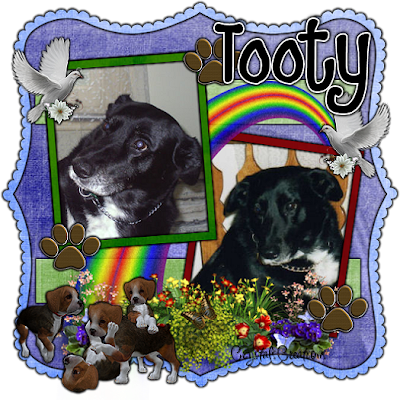 Also as a tribute to Susan's beloved Tootypup, who went to Rainbow Bridge yesterday, here are a couple of freebies Susan made last year to accompany the "Happy Tailz" collab her and I did. 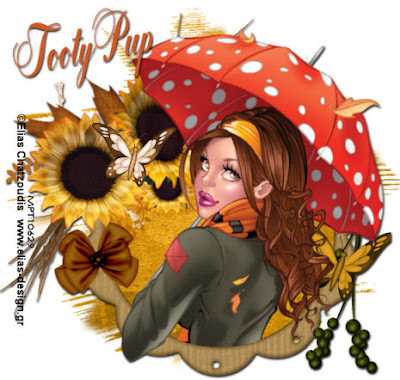 This gorgeous tag was created by Lori from our CT in tribute to Susan's dear Tootypup. Thank you Lori! Crystal has written this lovely tribute tutorial for Tootypup using Susan's "Rainbow Bridge" kit and featuring photos of her beloved Tooty. Thank you so much Crystal. 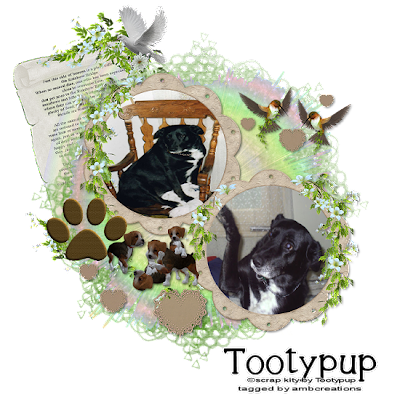 Dee has created this gorgeous tag for Susan featuring her beloved Tootypup and using her "Rainbow Bridge" kit. Thank you Dee. 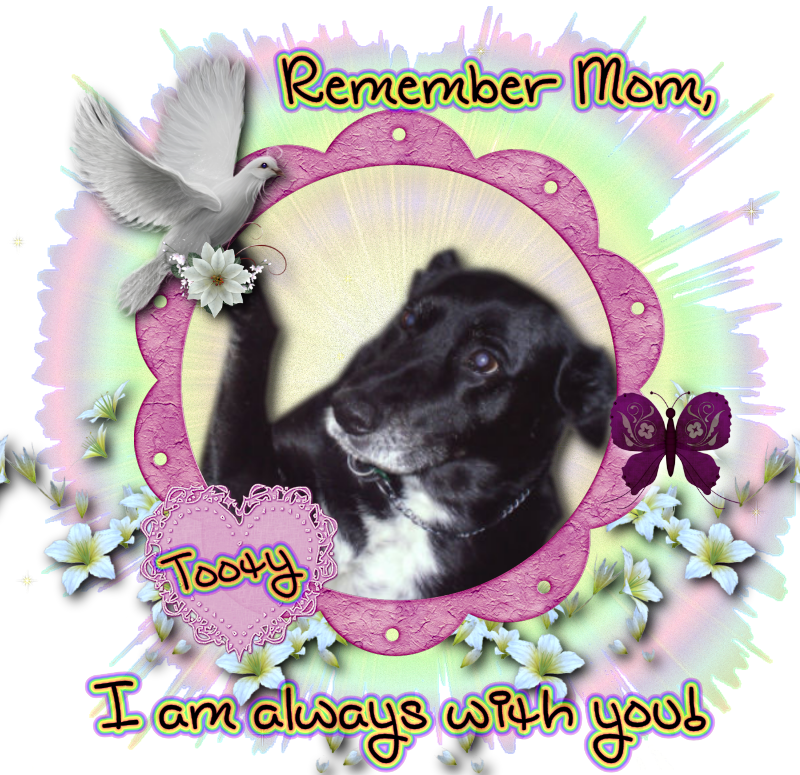 Yesterday I asked our CT girls if they were interested in tutting/tagging a special tag for Susan using her "Rainbow Bridge" kit and a photo of her beloved Tooty. A number of girls were more than happy to and this lovely one is by Amy Marie. Thank you sweetie. 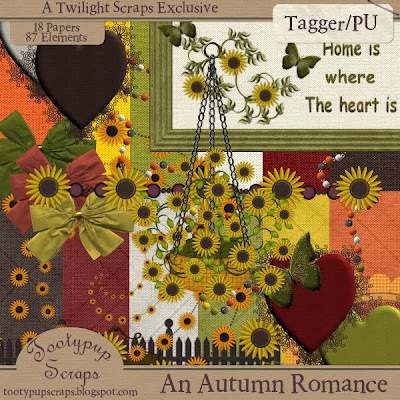 Shal, from Scrappin Warehouse, wrote this delightful tutorial featuring Tooty's "Autumn Garden" kit. Thank you so much, Shal. 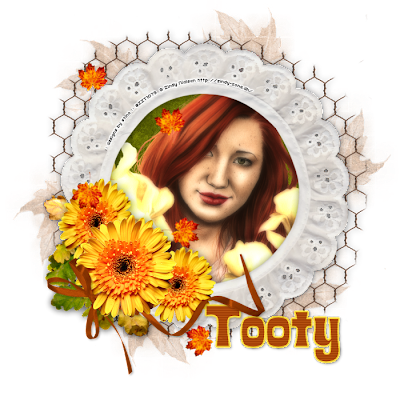 Dee, from our CT, has written this gorgeous tutorial featuring Tooty's "Forever Fall" kit. Thank you Dee! 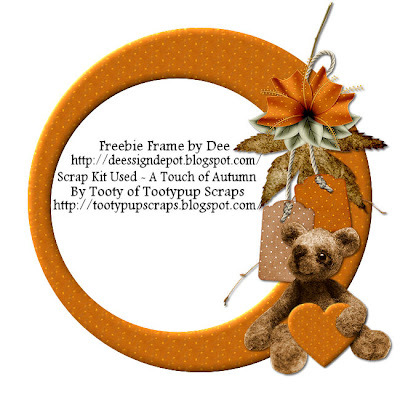 She has also created a gorgeous Cluster Frame freebie for personal use only which can be downloaded from her blog. This is Stina once again and I have some sad news to share. 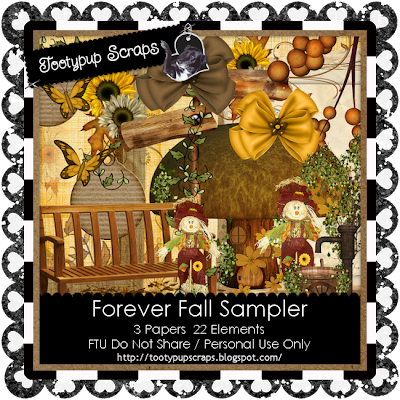 You may remember Susan lost her partner Dave just six weeks ago, and her scrapping friends got together and we created a gorgeous collab where all sales for the month of Setpember go to her called "Fall-Ever Friends". And you know the sales of the collab have gone towards helping her for which she is eternally grateful. Thank you everyone. 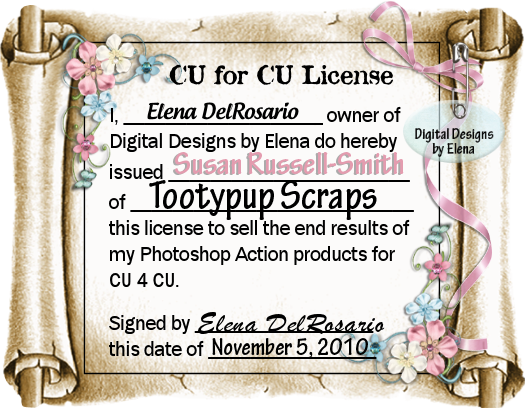 But how many know how Susan got her design name - Tootypup Scraps? 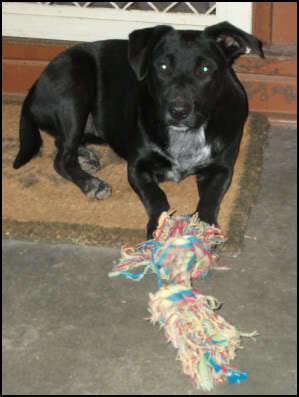 It is that of her bestest four-legged friend, Tootypup, who is a black lab cross kelpie and is 17 and a half years old (photo in the sidebar). Like me, Susan loves her animals and Tooty has been her companion, confidant and best friend through some of the toughest times of her life. 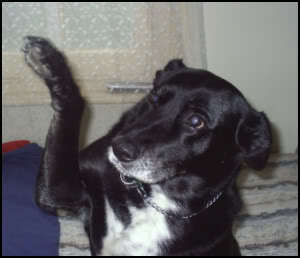 This last week Tooty has been on and off her food which, if anyone knows a Lab, is unusual. It got to the point she would only eat McDonalds which Susan went out to get just so she would eat. Then just after I said goodnight to Susan and went to bed a couple of nights ago Tooty had a turn and her legs went all wobbly and she couldn't stand. Her eyes rolled back for a moment and Susan became worried. She couldn't walk and had to lift her, and she's no small pup. Susan stayed with her for a couple of hours till she settled. When she told me the next day I thought it sounded like a mild stroke, as it was like what happened to my beloved Sheba when she had her first stroke some 4 years ago. It's rather frightening when it happens because you don't know what it is or what to do. I said if it was a stroke she would be off her food because she would feel nauseous and off-balance. But she started to eat a little. Then last night she went back off her food. This is always never a good sign, I know. Susan was so worried that I told her to call the emergency vet for some advice, as there wasn't much I could advise. He said from what she told him it did sound like a mild stroke, and she was to bring Tooty in first thing this morning at 8.30am. I knew she would worry all night, as would I about her. I told her to call me right away if the news isn't good. I laid in bed this morning thinking I never heard from her so it must be OK. But when I got up I found an IM message from her. And I rang her right away. Her beloved Tooty has the advanced stages of cancer. And it is of the pancreas. The most aggressive cancer. 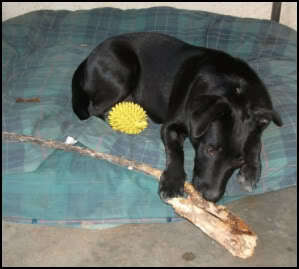 The prognosis is not good - anything from a week to a month, but not much more. Susan is devastated. She always knew this day would come but so soon after Dave she is not ready. And it is the last thing she needs. She told me soon there will be only her and maybe then she would turn up her toes by Christmas. I said "no, don't say that". She is devastated. 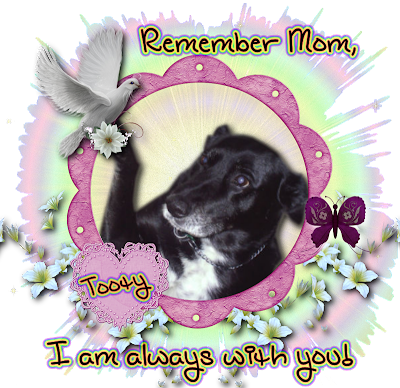 Tooty has been her best friend for over 17 years and letting an animal friend go is never easy, and no matter how long you know it will come, you are never fully prepared. I remember that feeling all too well. 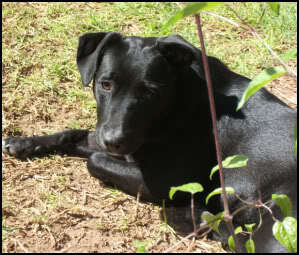 And I was a mess for a long time after I had my girl put to sleep - which by the way, will be 2 years on Wednesday. And the 1st anniversary since I started designing. So now Susan doesn't know how often she will be on, as she just wants to make the most of the last days she has with her baby girl, and after that she will be a mess. 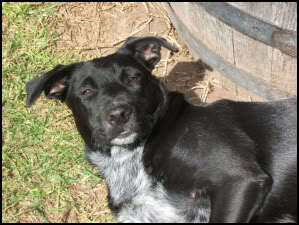 I am due to visit her in 3 weeks, and Tooty may or may not be there when I arrive. I am saddened by this, and devastated for Susan because I remember the pain of saying goodbye when you aren't ready to, and then having to let go as they quietly slip away. I was there holding my girl when she left, and I know Susan will be the same with Tooty. But so soon after the loss of Dave this really is the last thing she needs. 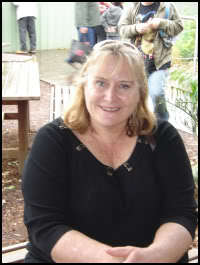 I just wanted to share with you all in case Susan disappears again...and she was slowly coming back again too. I honestly don't know how she is going to cope and I am so far away from her it's hard. I feel so sad right now for Susan. I tend to love animals, especially dogs, more than humans. lol There is just something so trusting and innocent about them. And they love you unconditionally. I have never met Tooty but I feel the pain too. 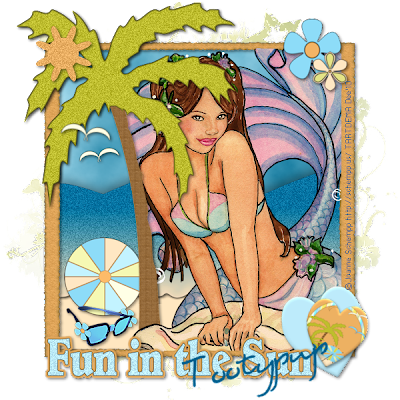 Dee, from our CT, wrote this cute tutorial featuring Tooty's Friday Freebie this week "A Summer's Breeze". Thanks Dee!! It's that time again! Yes, time for the Friday Freebie...and this week is another former collab as well as Tooty's first ever Full Size attempt. As summer has drawn to a close in the northern parts of the world and we downunder are awaiting it, I thought this week we would share this one with you - "A Summer's Breeze". Please leave some love if you download.....and enjoy!! A broken heart from the one she loved. Her secret she will never tell. She silenced his heart by taking his life. Now she suffers in silence the pain of this hidden secret that she can never tell. Her heart haunted by her own jealously and the soul of life she has taken. From the dark shadows she feels the eyes of the soul she had taken watching sending a shiver through her Haunted Heart. 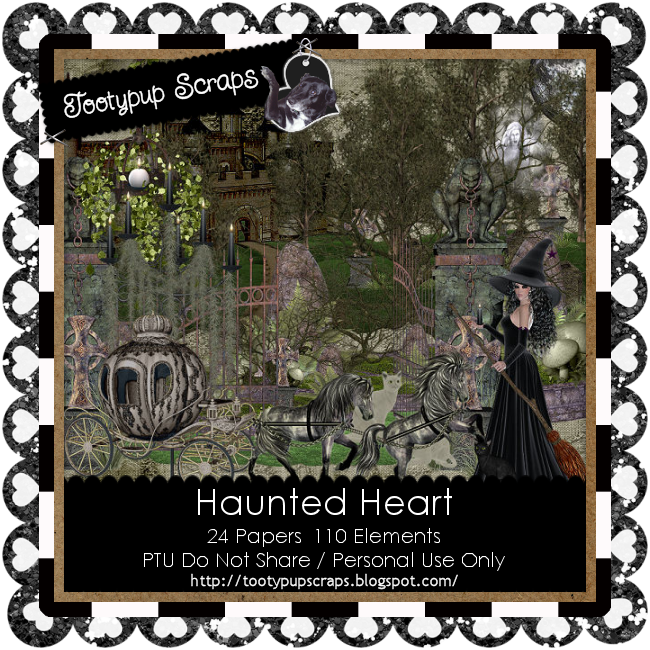 This kit is like an old time spooky movie, with many beautiful elements to touch the mood of Halloween. I do hope you enjoy playing with this as much as I did putting it together for you. This is a kit close to my heart being a animal lover. Especially Puppy Dogs....LOL. This kit is full of Puppy Dogs and everything that goes with them. Mischief. Lots of fun to be had playing with this kit. I do hope you enjoy. Autumn is my favourite time of the year. When mother nature paints the country side with the soft gentle hues to warm your heart before the winters snows. When the wildlife came out to play before the long winters sleep. When the morning mist creeps up through the old oak trees as the suns golden rays breaks a new dawn. I just love this time of the year. Well now it is time for you to have a play in the Autumn Fall. Happy Scrappin. It's Autumn/Fall and time to recall such bountiful delights at this time of year. A time when we give thanks and remember, a time to reminisce on childhood delights, lost loves or just to be thankful for what we have each been blessed with. Life should forever be of this thinking - that we should always enjoy a lifetime of Forever Fall and to be eternally thankful. 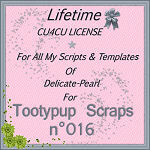 Tooty's part is a Sampler of a PTU version to be released shortly so stay tuned!! Now onto the rest of the train!! The Brat Pack is Going Crackers! It's that time again and this month the Brat Pack team are going crackers....Animal Crackers, of course!! 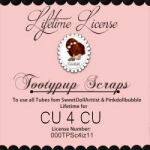 LOL We have tons of animal-themed goodies for you to enjoy through Tagger, Full Size and a couple of CU items. So jump aboard and ride the train with us!! Bear in mind that we are all in different timezones and some parts may not be posted yet...so just keep riding and stop back again! Don't forget to leave some love if you download using the comment section below! And we hope you enjoy the ride! Tooty's part is an "Add-On" to a PTU version to be released very shortly, so stay tuned! 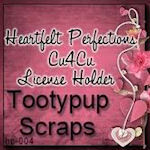 This tag was made using Stina's "Wrathchild" kit and Kylara, from our CT, kindly made a taggie for the PUP with it. Thank you, Kylara. 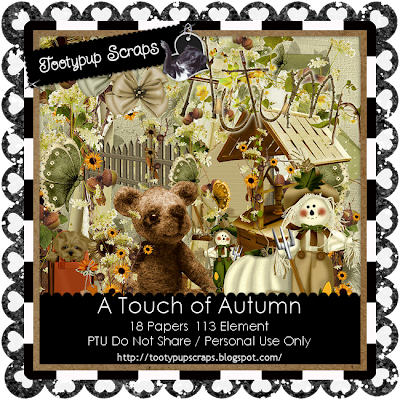 Kaci has written this lovely tutorial featuring Tooty's kit "Autumn Garden". Thank you Kaci - this is delightful! Lori has written this spooky tutorial featuring Tooty's awesome kit "What Lies in the Ruins". Thank you Lori!! Dee, from our CT, wrote this gorgeous tutorial featuring Tooty's kit "Mischievous Spooks", as well as a matching Cluster Frame freebie, which can be downloaded from her blog. 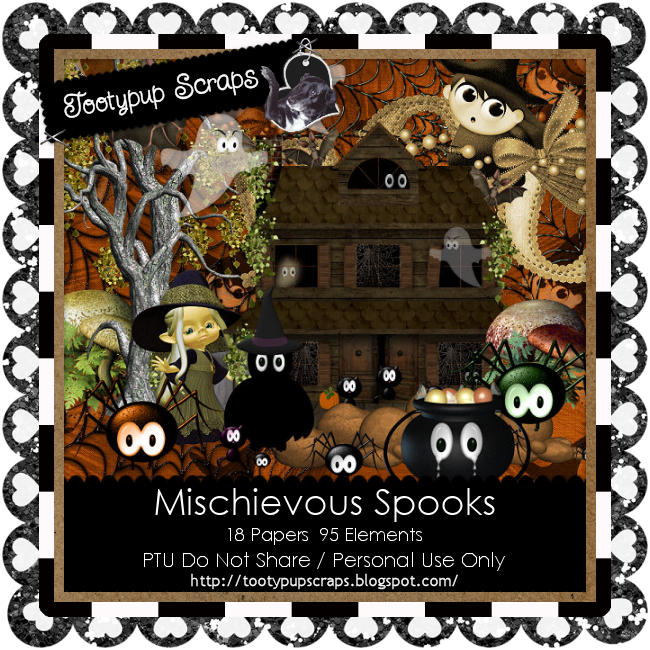 Cari (aka Black Widow), from our CT, has written this spookilicious tutorial featuring Tooty's latest kit "Mischievous Spooks". Thanks Cari!! 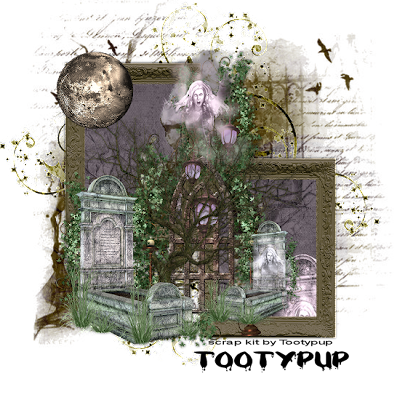 Amy Marie, from our CT, has written this spooky tutorial featuring Tooty's gorgeous kit "What Lies in the Ruins". Thanks Amy Marie!! Mami, from our CT, has written this gorgeous tutorial featuring Tooty's delightful kit "Goldilocks and Friends". Thank you Mami! Kelly/Karma, from our CT, wrote this delightful tutorial featuring Tooty's "A Letter for You" inspired by a favourite song of hers. Can't say I know the song, but the tutorial is lovely. Thank you, Kelly. 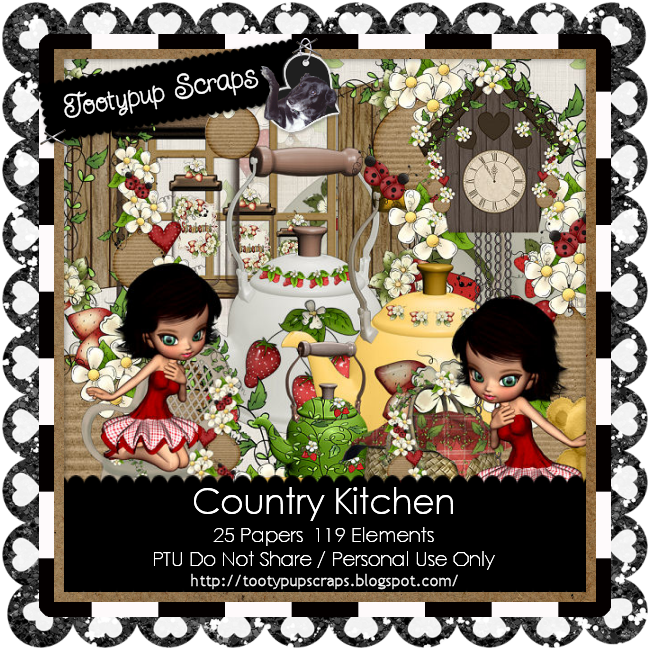 Crystal, from our CT, has written this tutorial featuring Tooty's latest Friday Freebie "Bippity Boppity Boo"! Thank you Crystal. 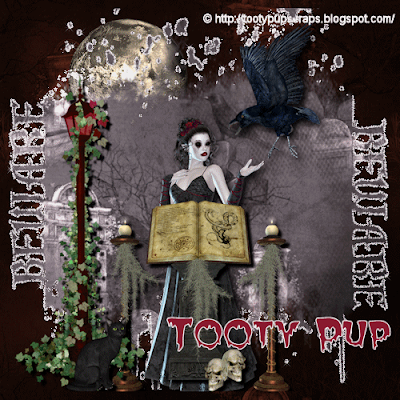 This week's Friday Freebie is another early kit of Tooty's designed for a store collab last year for Halloween, called "Bippity Boppity Boo". Given as Halloween is fast approaching we thought it appropriate to share this one with you this week and hope you enjoy it. 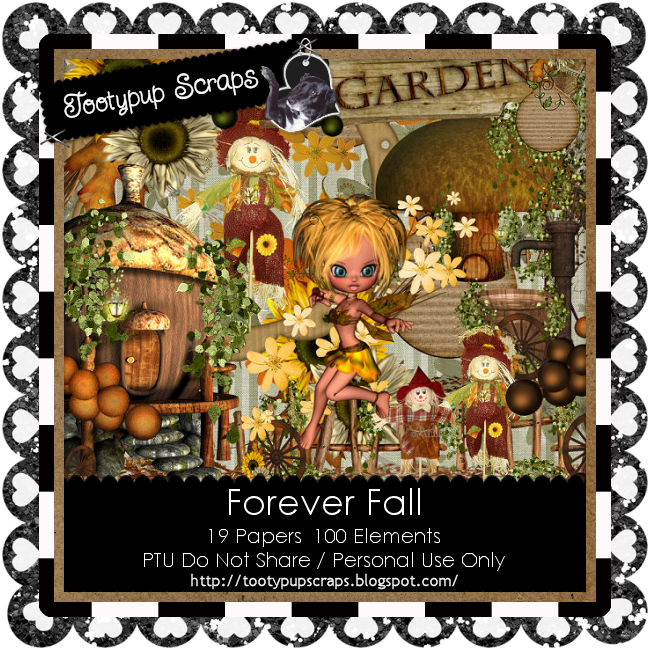 This delightful tutorial was written by Aimee of our CT using Bello Scarto's part of the "Fall-Ever Friends" collab for Tooty. 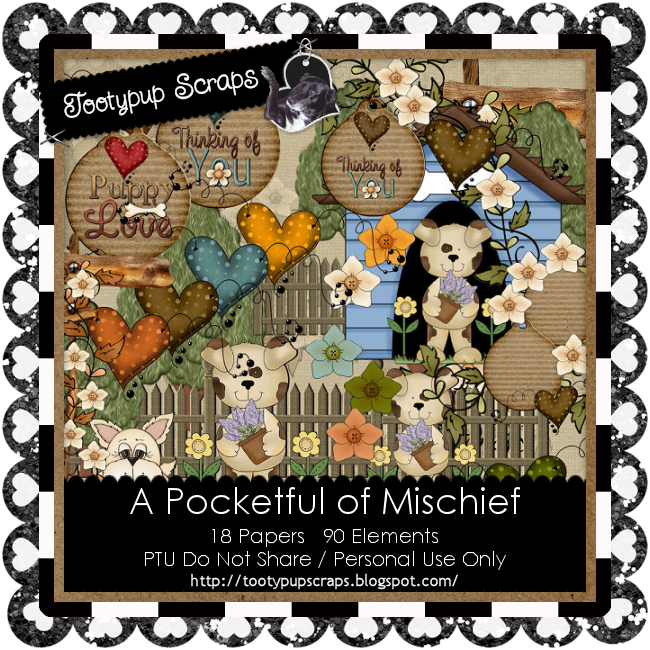 She also created a gorgeous Cluster freebie available for download. Amy Marie has written this lovely tutorial using Wicked Princess' fantastic part of the stunning "Fall-Ever Friends" collab for Tooty. Thank you Amy Marie! Amy Marie, from our CT, has written this delightful tutorial featuring Tooty's "Country Kitchen" kit. Awesome job, Amy Marie! Tooty has so many older kits laying about here that we took down a few months ago with the intention of offering them for free and never getting around to it. 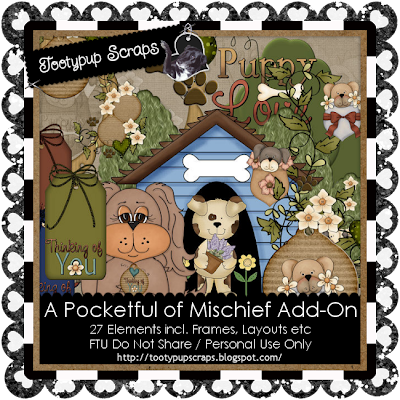 So I decided to finally kick things off with FRIDAY FREEBIES....and this one is one Tooty's earlier kits "Back to School", most of which was drawn by Tooty herself. Ok all, thank you for taking a peak. Have fun scrappin everyone. Well it has been awhile since the PUP has been around. Yes I am still here in the shadows. And as you all know a lot has been going on in my life. The times are a bit hard for me emotionally right now with the passing of my partner Dave. He was a very special kind of guy, and he was not well and hasn't been for a few years now. I have been keeping up with all the posts Stina has been placing on my blog. But I must admit, it took me awhile to even go anywhere near my e mail. It has all just taken so much out of me. Grief is so hard and I know there is a lot of you know what it feels like. I want to thank each and everyone of you for all your kind wishes, thoughts and prayer in this time. I am a quiet one and very much likes to sit in the background and with no fuss.....LOL....I got Stina to do all the talking for me....LOL...She has been my rock through all this. I would be so lost without her holding me up. You're DA bestest BUD you know Stinee one could ever want to have. Now where to start with what I saw in the mail today - the Fall-Ever Friends Collab. My eyes filled with tears to see what everyone has been up to just for me. No one has ever done anything like this for me before. EVER! I felt so overwhelmed in the nicest way to think that there are so many out there thinking of the PUP and wanting to do this for me. I truly do feel unworthy of this awesome gift of love and friendship you have given to me, by all doing this awesome, most beautiful and gorgeous collab I have ever seen. There are so many more in need, more than I am, out there. But I want to thank you all from the bottom of my heart for this and all the work you have put into it. What can I say. I am speechless. Words just aren't enough for all that you guys have done here for the PUP. Man it is hard to see doing this with tears in your eyes. Thank You - Thank You - Thank You. You are all awesome friends to have. And I have the most warm feeling in my heart now because of you all now. I know time will heal the pain I feel now, mmmmmm well maybe not heal so much as learning to cope with it all. But the PUP will as many other have done in their lives. Thank you all so much for just being you..... The best friends one could ever wish for. Love and Hugs to you all forever and ever. This is a very special one also written by the PUP's bud Stina using Heartfelt Perfections' part of the stunning "Fall-Ever Friends" collab. 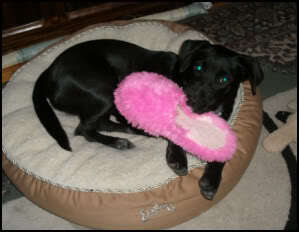 Thank you Stinee from da PUP!